Conditions for star formation and evolution must be very different in the centers of galaxies. If we lived in the center of a galaxy, there would be a million stars between us and another star at 1 parsec distance such as alpha Centaurus. In our actual position, alpha Centaurus is the closest star. This huge density of stars may cause peculiar things to happen to them as they form and evolve. In addition, centers of galaxies harbor ultramassive (up to a billion M ) black holes that we see as quasars or bright radio galaxies, exotic objects that make huge amounts of energy. Conditions around them must be so extreme, they test our laws of physics. In the nearest galaxies, the highest resolution pictures we have taken show details only down to 10 to 30 light years. With perhaps 100,000,000 stars lumped together, we can barely see even the brightest individual stars. Also, we cannot study what happens really close to any possible black hole. The center of the Milky Way is 100 times closer than the next closest galactic nucleus, so we can take pictures showing details 0.03 light years in size. This "cosmic zoom lens" makes the Galactic Center have an importance for galaxy studies similar to the importance of the sun for stellar work. 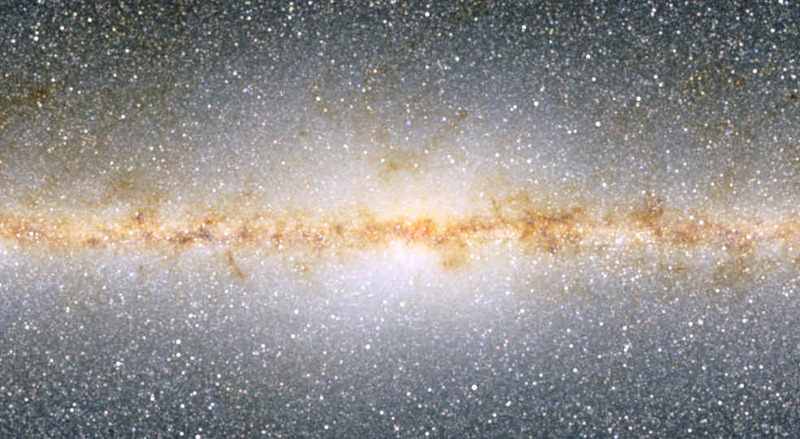 However, extinction makes the Galactic Center inaccessible to visible-light astronomy. It was located approximately by radio measurements, then definitively in the starlight at 2 microns. The central few hundred parsecs in visible light: the view is dominated by thick obscuring clouds in the disk of the Milky Way. An infrared image about 10 parsecs across shows lots of very luminous stars and leaves little doubt where the true center lies (From M. & G. Rieke). Even knowing exactly where to look does not help in the visible -- there are just a few foreground stars that lie in front of the heavy clouds of obscuring dust that hide the real center. Many galaxies have supermassive black holes at their centers. Could ours be one of those? If so, why is the black hole so dim? 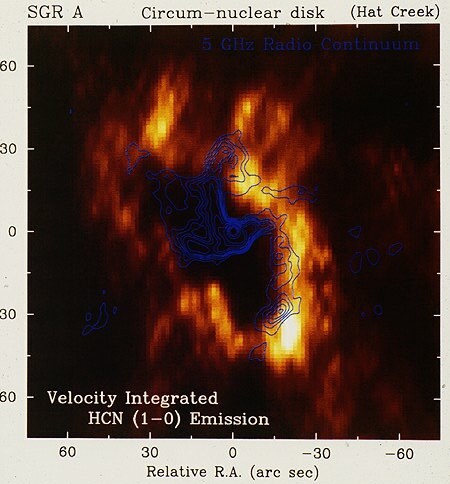 Ever increasing resolution in infrared images showed the black hole is not the energy source. 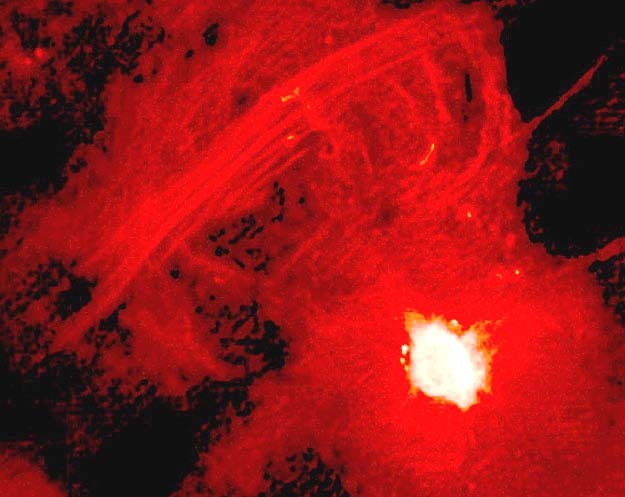 The brightest source in the very high resolution near infrared image to the right is IRS 7, a red supergiant that puts out most of its energy in the near infrared. The other bright stars are also very young and massive. 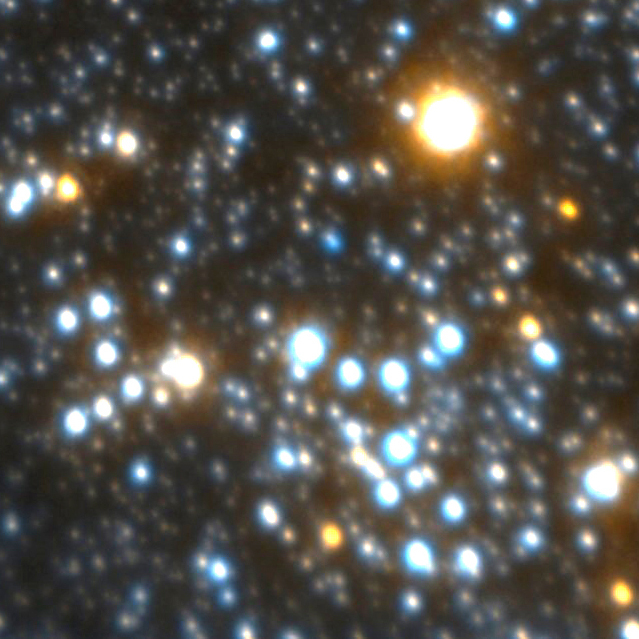 The blue-appearing ones in the center of the image are a unique clustering of very luminous, massive stars. Any black hole must be invisible. (image from Gemini Project). 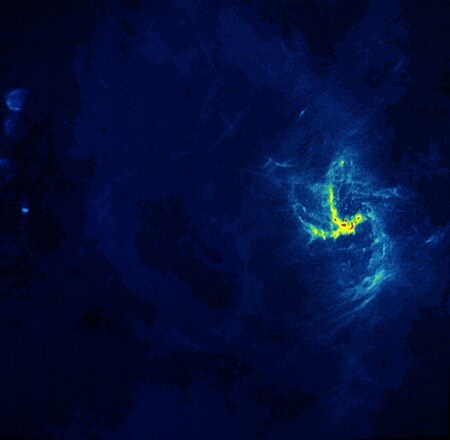 If the black hole dominated the energy of the Galactic Center, it would be the second brightest source in the infrared image. However, we can see the black hole faintly in the radio! Can we prove there is a black hole????? A much bigger flare may have occurred 500 years ago, when briefly we might have had an active galactic nucleus (discussed on the next page)! The lack of energy from the Galactic Center black hole has turned out to be a major challenge to our theories of black holes. 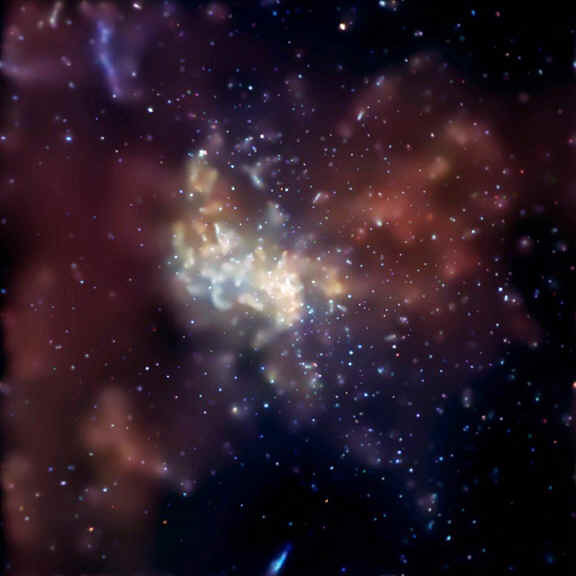 We think that the matter surrounding the black hole in the Galactic Center is very hot and in a sphere rather than a disk, and virtually transparent to its own radiation so it does not heat up efficiently. The energy is not emitted in the X-ray, but is carried inward by the flow of matter toward the event horizon. What is happening with the interstellar gas? 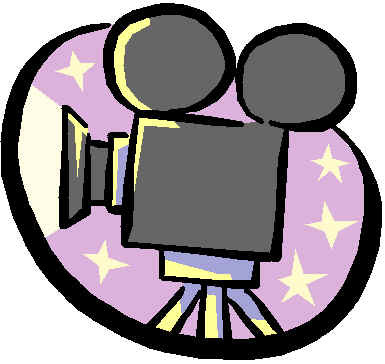 What stopped the black hole from having access to lots of matter to generate energy? Here is an image in the emission of the HCN molecule, shown in yellow and orange. We see a ring of molecular material (diameter about 2 parsecs) surrounding the black hole. It is shown here imaged in a radio molecular emission line, but it shows up in other ways too. The minispiral is superimposed in blue contours. It appears to be filaments of gas falling inward from the molecular ring. The center of the molecular ring is filled with young stars. Why did these stars form, rather than the material falling into the black hole and making it a bright source? We do not know the answer for sure. Spectra show many of the brightest sources are normal red supergiants. As a result, we conclude we are seeing the normal stages of evolution of massive stars. 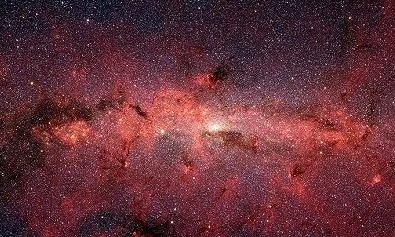 Stars must have formed in the Galactic Center in the last 10 million years, since that is how long it would take to evolve to the red supergiant. So, the energy comes from young, hot stars, but how they formed so close to the black hole is a mystery. Material that was on its way to feed the black hole evidently became unstable and broke up just in the nick of time to avoid falling in!